With the weather continuing to be very cold and wintery, it is important to think about caring for our horses and keeping them safe in the bad weather. 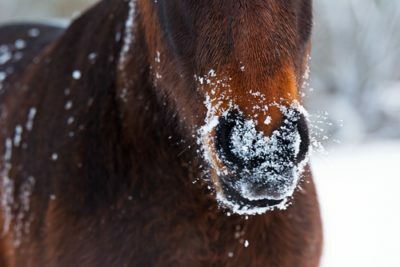 Irrespective of the management system used, there are many factors to be considered when caring for horses over winter. 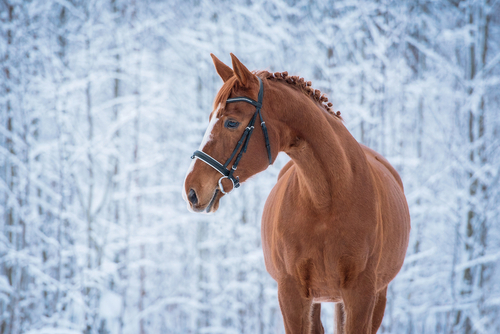 Here our Briovet Vet addresses some of the factors to be considered when to maintain horse health over the winter. Take care of hooves in winter. Hoof care is just as important in winter as summer. Make sure your horse drinks enough water in winter to prevent dehydration. Dry winter feedstuffs and hay may contain less water than the grass they fed on in the summer. So it’s important that they are encouraged to drink more in winter months. A high quality probiotic can help promote a good appetite. They are great to support the digestive process and gastric health. If using blankets, make sure to remove/change blankets as weather changes and according to your horse’s needs. Ensure the blanket fits your horse properly and that straps are secured properly. Reduced or limited access to grass means that horses are not constantly eating and producing saliva. Saliva contains bicarbonate which helps to neutralise stomach acidity. In the absence of constant saliva production, the horse stomach is prone to large fluctuations in acidity which can cause pain and/or gastric (stomach) ulcers. Poor quality grass, silage or hay does not meet the mineral and vitamin requirements of horses. Also poor-quality hay especially, increases the likelihood of respiratory disease. Supplementation with concentrated feeds is necessary to meet the nutritional requirements of most horses. The introduction of concentrated feed requires the presence of healthy bacteria in the intestine (microbiota) to adapt and change in response to concentrated feed. Feeding concentrated feed and feeding hay is associated with an increased risk of gastrointestinal disturbance compared with feeding grass alone. Consequently, the incidence of colic increases during the winter housing period. Some horses are inherently “poor doers” and have a poor appetite and intake of concentrated feeds. Housing and mixing horses often results in colds and coughs. Antibiotics are frequently used to manage bacterial respiratory disease and they may negatively impact on the healthy intestinal microbiota, so that the risk of bad bacteria becoming established and causing disease increases. ProBio Forte contains probiotics which confer a health benefit to the gastrointestinal system of the horse. Probiotics help to boost the presence of good bacteria in the intestinal microflora. This is especially important during and following a course of antibiotics. The healthy microflora in turn, produces many B vitamins required for normal cell function, and required to support gastrointestinal immunity. These healthy microbiota also contribute to stabilising stomach acidity and reducing large fluctuations in pH. ProBio Forte also contains threonine which is a component of mucin that lines the gastrointestinal tract and forms a protective layer against acid and bad bacteria. ProBio Forte contains prebiotics which work by competing with bad bacteria and toxins so that they are less likely to bind to the intestine. Prebiotics are also an source of nutrition for the microflora and help the microflora to digest and use food more efficiently. ProBio Forte contains important antioxidant vitamins such as vitamin E and Vitamin C. These protect cells against damage caused during normal cell respiration and metabolism. The B vitamins in ProBio Forte are essential for normal cell metabolism and function and they promote a good appetite. Finally, enjoy your horse over the winter months. 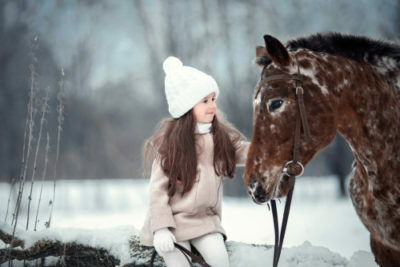 There is simply nothing better than spending time with your horse on a crisp winter day! 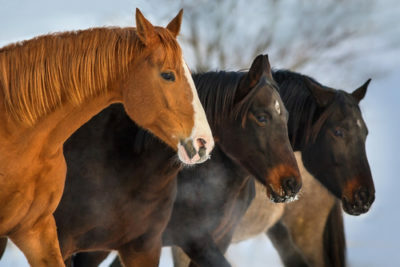 This entry was posted in Horse Health, News and tagged caring for horses in winter, horse health in winter, winter horse care, winterising horses.